Meghan Markle maternity style: Who is her favourite designer – is it the same as Kate’s? Meghan Markle has worn a number of stylish outfits throughout her pregnancy, and has always paid particular attention to her shoes, so it no surprise that her favourite designer is the shoe brand, Aquazzura. The Italian luxury footwear brand was founded in 2011 and creates colourful designs that focus on comfort and style. During her own pregnancies, Kate Middleton, 37, opted to wear maternity brand, Seraphine, which she wore six times during her pregnancy with Prince Louis. A fashion expert has revealed why they chose different designers and how they stayed true to their personal styles throughout pregnancy. Speaking to Express.co.uk, fashion expert and director of footwear brand Daniel Footwear, Mark Buxton, said the Duchesses choices say a lot about their personalities. Mark explained both Meghan and Kate use their fashion to reveal a bit about themselves, and Meghan’s choice highlights her focus on being both elegant and fun. Mark said: “Meghan Markle is obviously a fan of heels. A heel can bring a look together and really make a bold statement, especially while pregnant. When it came to her favourite clothing brand, Meghan has stuck with luxury designer Gucci more than any other, according to LovetheSales.com. Speaking about Kate’s style, Mark explained how her choice of London-based brand, Seraphine, showed a lot about her personality. Mark told the Express.co.uk: “When it comes to Kate, she has been a great example and inspiration for how to stay trendy throughout pregnancy, which is often a time where mums are most self-aware of their bodies. “It has been amazing to see Kate wear Seraphine – known for their super affordable, trendy pieces. 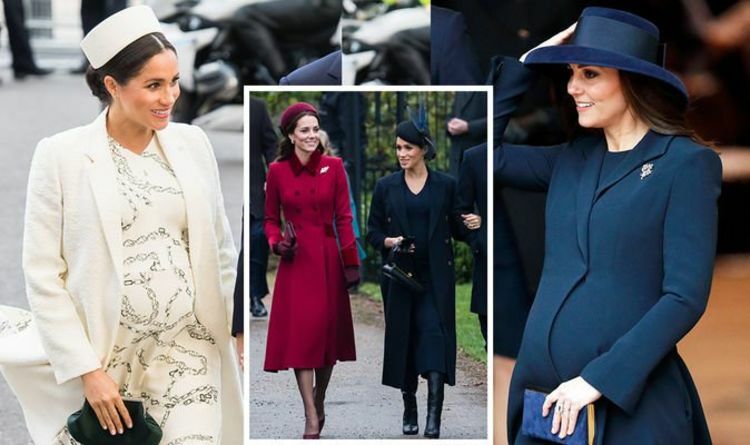 Despite choosing to wear different styles, both the Duchess of Sussex and the Duchess of Cambridge have made sure their outfits show their personality. Throughout their pregnancies, which Duchess kept their look ‘classic’? London-based stylist Lauren Jobling told Express.co.uk each woman remained true to her personal style throughout their pregnancy. While Kate didn’t bring attention to her bump, Meghan did, wearing skin-tight garments. Meghan and Kate both used this trick during their pregnancy. Both of them sported shorter hemlines throughout their pregnancies, as this creates a flattering silhouette.